It’s one of the most sought after phrases in the world. The things people will do to hear someone say, “I love you” have surprised us in countless stories, movies and songs. The things people will do for someone who loves them are equally as astounding. Why do we love hearing, “I love you” so much? Maybe its the promise of holding a place in someone’s heart, or the awakening knowledge of a new significance you hold in someone’s life. Often it’s the phrase expressed before a relationship takes it’s next step, the expression that one is loved for all their silly quirks, for their looks, for their heart, or for who they are (the good, the bad, and the imperfection). People thrive off that idea, that they are enough, that they are someone’s everything. I believe in love. I believe in its strength and significance in relationships. But I have also learned that love isn’t always enough. You need more than love to make a relationship work. Love starts many great romances, but love alone won’t make a relationship last forever. 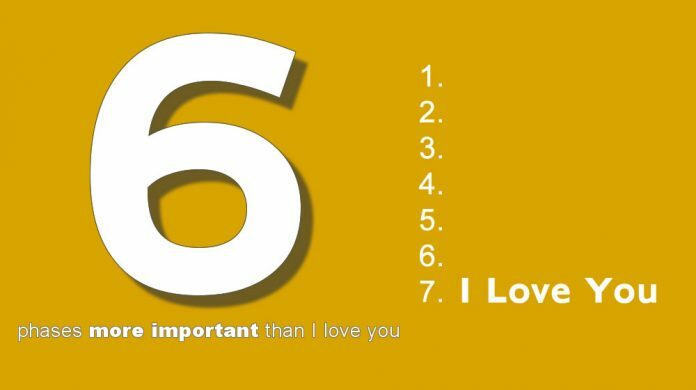 There are six phrases that I think are as important, and possibly more important than “I love you.” Phrases that I think we should all hear from those we are close to. Phrases that should be as important to us as a declaration of love. I forgive you for all the things have done, or will do, that may hurt me. I forgive the way you may lash out when you are hungry, I forgive the things you may say when you’re tired after a long day. I forgive the times you didn’t even know you upset me. I forgive your big mistakes and the small ones. I forgive you for not knowing what I needed when I thought you would, or even expected you to know. I forgive you when you fall short, because I see how hard you are trying. I forgive you the way I hope you’ll forgive me because I know neither of us our perfect. 2. I’ll sacrifice for you. I’ll sacrifice my time for you. I’ll be selfless for you. I’ll stay up late with you as you learn to care for our new baby, even though I have work in the morning. I’ll hold you when you’re sick. When you are weak, I will be your strength. I’ll be there for you at 3am as readily as I would at 7pm. I’ll be there when no one else is, and I’ll be there 100%. In sickness and in health, my willingness to be there won’t change. My sacrifice is not dependent on your state of being, but rather it is there because you exist and you are someone worth sacrificing for. I respect you for who you are, and not for what I feel you deserve. I respect you because you deserve my respect, not because you earned it. I’ll respect your opinions and consider your feelings. I’ll treat you like a person with your own thoughts, hopes, dreams and desires. And those thoughts, hopes, dreams, and desires will matter to me the way they matter to you. I’ll support your hopes and your dreams. I will always have your back. You can rely on me. I’ll raise you up and never tear you down. I’ll always make sure you have what you need, physically, emotionally, spiritually and mentally. I’ll lift you back up when you fall. I’ll protect you from harm. I’ll protect your heart from pain. I’ll protect the idea of us. I won’t demean you. I’ll treasure you and shield you from evil, bad and ugly. I won’t let others put you down. You will be safe in my arms, safe in my hands and safe in my heart. I’ll be your safe haven, your safety net, and someone you can always trust. 6. I’m committed to you.I won’t leave you. I will be here for you again and again. I’ll make this work a priority in my life. I’ll look back on our beginning, I’ll work on our now and I’ll look forward to our future because we are something that I want to last forever. In an ideal, perfect world, I truly believe that all these attributes come together as one and are expressed through pure and unconditional charity. It is a trait we should all strive to develop. But from my experience, we are human, and we fall short of this perfection — even towards those we love. If true love was all that we needed, love wouldn’t be so hard and relationships wouldn’t fall apart so easy. The truth is there are lot of people you can love, but very few relationships that you can make last forever. That’s why a person is capable of loving someone more than life, but knowing deep inside that it would never work. That is why people are capable of walking away from those they love. That is why someone can give up a life full of love for a single moment of weak and selfish pleasure. That is why people lie, steal and cheat to, from and on those they love. I have loved a lot of people, but I am not with those people. I am with the man who gave me more than love. I am with the man who looked past my mistakes. I am with the man who sacrificed for me. I am with a man who honors and respects me. I am with a man who takes care of me in more ways than one. I am with someone who makes me feel safe and secure. I am with someone who I know will love me through the thick and the thin, who hasn’t left nor will leave me when time are tough.